Even under ideal weather conditions, speed kills. While driving right at the speed limit may technically be legal, it’s not a good idea for snowy or icy roads. If the weather’s bad, take your time and don’t be afraid to travel well below the speed limit. Plan extra time into your schedule so you don’t have to hurry. If the road is slippery or the driver in front of you suddenly stops or swerves, you don’t want to be positioned right behind them. Always keep a safe traveling distance between you and the car or truck in front of you. Avoid the overuse of your foot break, especially when your entire unit isn’t totally straight on the road. This can cause the trailer to slide. Leave plenty of time and room for braking. Above all, do not engage the Jake brake on icy roads. During your circle check, ensure that the defroster, heater, wipers, wiper motor, and all lights are working correctly. You should also check washer fluid levels, tire pressure, brake set up, mirror cleanliness, and air tank moisture. Wipe off snow and ice so that you can be seen in low visibility conditions. Be particularly cautious when using exit and entrance ramps, traveling over bridges, and going through intersections. These areas are particularly prone to ice. Brake early, avoid sharp turns, and reduce your speed in these spots. Be careful of black ice, as well. Just because a road looks clear doesn’t always mean that’s the case. Even when you take all possible precautions, crashes can still occur. 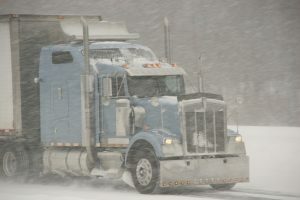 If you’re in a tractor trailer truck accident this winter, we can provide the valuable counsel you need. For more information, contact us today.